The 2006 Brut Vintage from Champagne Pol Roger is an attractive deep golden colour with a continuous thread of lingering bubbles. The nose is instantly powerful and complex, revealing the maturity of the wine, developing aromas of quince and apple, combined with richer notes of dried fruits. The palate shows a creamy, voluptuous and well-balanced structure. The long-lasting aftertaste boasts sumptuous almond nuttiness balanced with citrus freshness. The wine has a full-bodied structure, and pleasing maturity, without detracting from the overarching delicacy. The 2006 Brut Vintage from Champagne Pol Roger is made from the traditional house vintage blend of 60% Pinot Noir and 40% Chardonnay from 20 Grands and Premiers crus vineyards in the "Montagne de Reims” and the "Côte des Blancs”. Produced only in limited quantities the Brut Vintage 2006 has been aged for 8 years in our cellars before being disgorged and released onto the market. The must undergoes two débourbages (settlings), one at the press house immediately after pressing and the second, a débourbage à froid, in stainless steel tanks at 6°C over a 24 hour period. A slow cool fermentation with the temperature kept under 18°C takes place in stainless steel, with each variety and each village kept separate until final blending. The wine undergoes a full malolactic fermentation. Secondary fermentation takes place in the bottle at 9°C in the deepest Pol Roger cellars (33 metres below street level) where the wine is kept until it undergoes remuage (riddling) by hand, a rarity in Champagne nowadays. 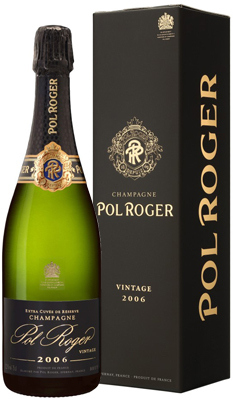 The very fine and persistent mousse for which Pol Roger is renowned owes much to these deep, cool and damp cellars. The first three months of 2006 were very dry, followed by two months of heavy rainfall. Without any spring frost, the development of the vines was promising. A warm and sunny June provided optimal conditions for flowering. August was cold and humid, however it was followed by warmth and sunshine in September, which encouraged an exceptional development of the bunches and the grapes were very healthy at the time of the harvest. The earliest parcels were picked on 6th September and the latest on 25th September. The 2006 vintage displayed a potential average degree of 10.2% and total acidity: 7 H2SO4g/l.